Distribution and habitat: Senecio rowleyanus is native to southwest Africa. It grows long, trailing stems of spherical leaves. In the wild they grow strings between rocks and other plants which offer them some shielding from intense sunlight. The stems of Senecio rowleyanus trail on the ground, rooting where they touch and forming dense mats. Description: Senecio rowleyanus is a creeping evergreen perennial succulent with cascading stems of large, round, bead like leaves. Its trailing stems can reach 60-90cm (2-3 feet). There is a small point at the tips of the spherical leaves and a window on the side. This window allows the light to enter the leaf for photosynthesis but protects the cells from extreme heat. The leaf sphere shape allows the most water storage and reduce the surface area exposed to the hot sun and dry air, thus minimizing the loss of precious water through evaporation. It bears white daisy like flowers during the summer. The flowers are clusters of small 1cm (0.4 inch), white trumpet-shaped flowers studded with colorful stamens. A compound flower which looks like a cluster of tiny white lilies with long anthers sticking out the center of each flower. The small white flower is not showy but fragrant. The bloom will last about a month. The flower is followed by seed. The seeds have cottony filaments attached probably to aid the spread with winds. It pops open like a dandelion. 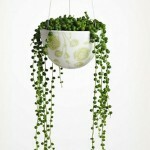 This plant is more of the novelty than anything else, grown in hanging baskets by collectors of unusual plants. 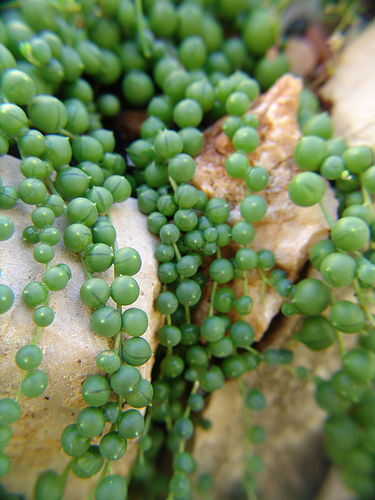 It is grown for its foliage, long wiry stems connecting a series of bead-like leaves. 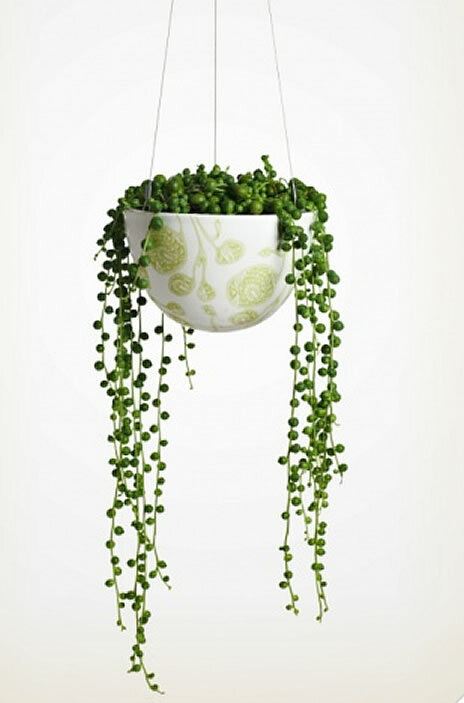 Houseplant care: Senecio rowleyanus is cultivated indoors as an ornamental plant for hanging baskets. With good care, a Senecio rowleyanus house plant will live for several years. If long stems become straggly, cut them off. Poke healthy stem tip cuttings back into the soil to create a full, lush plant. 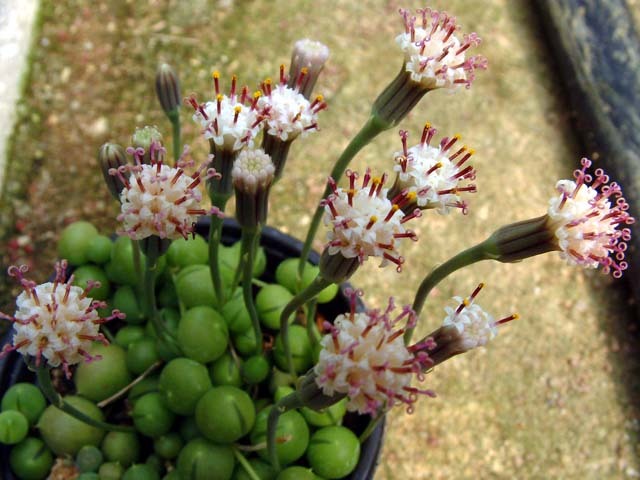 Despite its delicate appearance, this unusual succulent house plant is a vigorous grower, quickly creeping across the surface of the pot, then cascading down the side. Light: Indoors, Senecio rowleyanus prefers a well lit position free from cold draughts. Give these plants bright light with some hours of direct sunlight daily. Temperature: It prefers warm temperatures between 21-27°C (70-80°F) from spring through fall. In winter provide cool temperature about 13-16°C (55-60°F) for this plant. As this plant is a succulent, the humidity is not an issue. It will thrive in average to dry room humidity. Water: Water thoroughly, then allow to dry out slightly between waterings. This plant will not tolerate soggy soil. Cut back on water in winter, watering just enough to prevent the soil from drying out. Feeding: Feed once a month from spring through fall with a standard liquid fertiliser diluted by half. 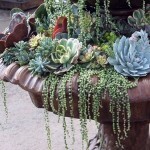 Potting and repotting: Repot in spring when this succulent outgrows its pot. Use a pot with using a cactus potting mixture or use 3 parts good quality potting soil and 1 part sharp sand. Good drainage is essential to prevent root rot. The plant only produces weak surface roots, so a well draining mix and a shallow container would seem to be called for. Growing this succulent in a clay pot will help maintain a healthy root system. Propagation: Take 10cm (4 inch) stem tip cuttings in spring or summer and insert them in moist potting medium. Press them into the potting mix until the leaves are almost covered. Keep the medium lightly moist. They will root quickly from the axils where the leaves are attached to the stem. 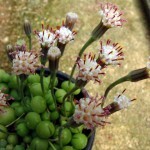 Make Senecio rowleyanus to bloom. The leaves of Senecio rowleyanus that look flat are a sign that the plant is too dry. Give it a good drink, but take care not to overwater. 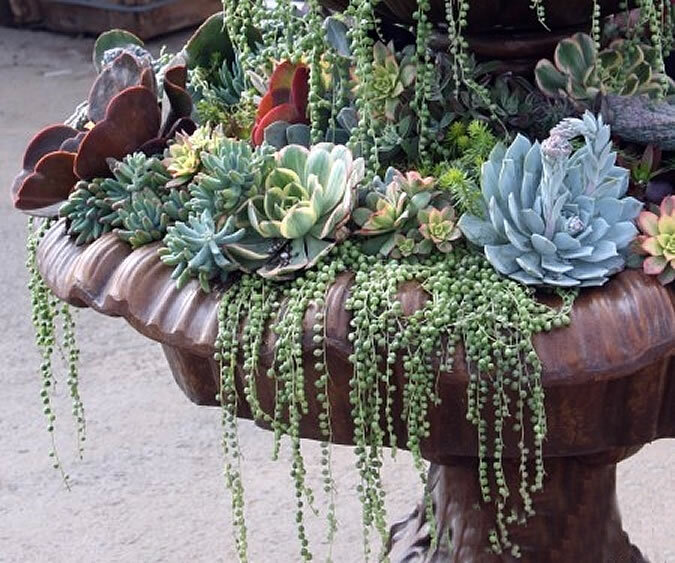 Overwatering this succulent may promote rotting. Treatment: Use an appropriate insecticide. Treatment may need to be repeated with annoying pests like mealybug, which can be spread by ants. Uses: Senecio rowleyanus is an ideal plant for indoors and patios in hanging baskets or containers. This plant is drought-tolerant, therefore it is suitable for xeriscaping.